INDEPENDENCE, Ohio (AP) With one deadline looming on his future in Cleveland, LeBron James has been in contact with the Cavaliers through his representatives. Following the NBA draft on Thursday night, Cavs general manager Koby Altman said he has had positive discussions with the three-time champion’s group. James has until June 29 to tell the team if he will pick up his $35.6 million option for next season or become a free agent. ”We continue to have good dialogue with his management team,” Altman said. ”I think LeBron has more than earned the right to approach his contracts the way he does. He’s done that before, so this is nothing new for us. We want to respect his space during this process and I continue to have really good dialogue with his management team as he goes through that process. James led the Cavs to their fourth straight NBA Finals this season, carrying a team that endured injuries and a roster overhaul at the trading deadline. 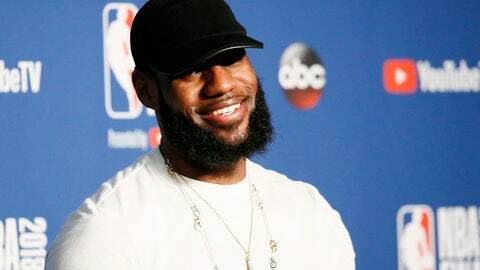 Cleveland was swept by the Golden State Warriors, and following Game 4 the 33-year-old said he would weight family concerns and his desire to win more titles into his decision. James has signed several short-term contracts since returning to the Cavs in 2014 after spending four seasons with Miami. After the Cavs won the championship in 2016, James signed a two-year contract with an option for this season. The Cavs can offer him a five-year, $209 million deal this time. It’s possible James could choose to sign a one-year deal again with a player option and go through the free-agency dance again next summer. To look more appealing to James, the Cavs need to upgrade their roster and they took a significant step by selecting Alabama point guard Collin Sexton with the No. 8 overall pick. Sexton averaged 19.2 points as a freshman and he addresses the club’s biggest need – a playmaker to fill the void left when the Cavs traded All-Star Kyrie Irving last summer. Altman hopes Sexton’s arrival will make the Cavs more attractive to James. The 19-year-old lacks professional experience, but Altman pointed out that James dealt with that issue this season. ”He went through it this year a little bit with some of our young guys, especially in the playoffs,” Altman said. ”What’s amazing, he talks about this all the time – the best teacher is experience. And our young guys got some really good experience this year. And while it wasn’t consistent throughout the playoffs, each guy had their moments. And we went through two Game 7s and got to a Finals, and that experience is a huge teacher for those guys.